WOW!! We just had to share this amazing StyleTip! Whether you are looking to spruce up your home to sell, stage, or just update where you live and your furniture is absolutely perfect to keep but just outdated in color and style... check out this Home Decor MAKEOVER Made Simple by Simply Spray! In my house, I have my grand-mother's old dining room set... the seat cushions look the age but instead of re-upholstering with fabric and making it a costly update.. 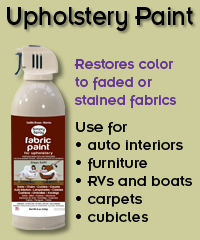 I found Simply Spray and I cannot wait to tackle this makeover on the seat cushions and update the color and look. Same for a house on the market, don't buy new furniture to stage your house, but do try to update what you have to neutral and more appealing colors and decor for your potential buyer. Simply Spray might just be your friend! This is a great find and hope you think so too!